News & Blogs The Ginkgo House is buzzing with electricity! The Ginkgo House is buzzing with electricity! 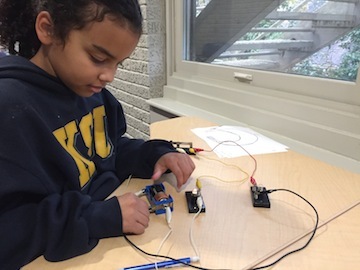 New School Montessori students in 4th-6th grade are learning to build circuits using conductors (wires), a driving force (batteries), and the load (light). 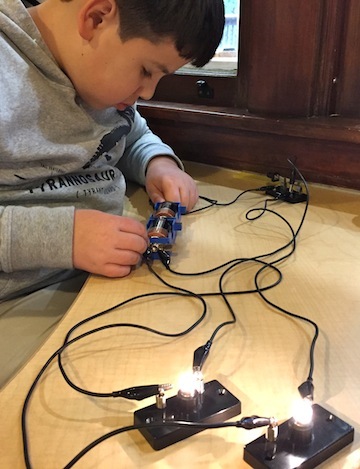 They have built both parallel and series circuits and have discovered first hand what happens when one of the lights is removed from the circuit. This is a timely experiment as many notice this problem at home while setting up holiday lights if one bulb is burned out or has become loose.